Blad i rustfritt 440C stål med tommelknapp for enhåndsåpning. Designet av Tom Krein fra Arkansas, USA. Tom Krein from Arkansas was previously known primarily for his sturdy hunting and outdoor knives. But for some time, he has been working on strengthening the construction of folding knifes, and his newest design, the Gitano, is something to be proud of! The full-length Folder with the ergonomically perfectly design grip is based on the historical Mediterranean Navaja. Tom Krein has executed the historic model beautifully in a completely functional and modern knife concept. The generously sized handle allows for different hand positions, from a short-gripped knife for finer work to a handle much farther back for greater reach. The slightly bent handle end thereby ensures the knife lies securely in the hand. Despite its total length of almost 25 cm, the Gitano is a relative lightweight with 181 grams, making it quite comfortable to carry. The blade form is also based on the Navaja and would be described as a modified clip-point blade today. 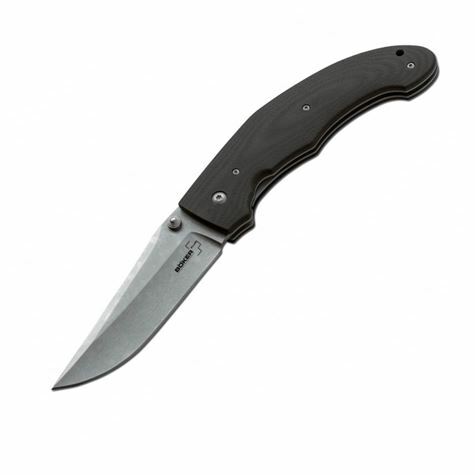 The covering of G10 is comfortably contoured and the steel plates with a liner lock ensure stability. Blade steel 440C. Removable clip. Total 24.6 cm. Blade 10.7 cm. Thickness 3.2 mm. Weight 181 g.